Each house, each family has their own traditions they stick to when colouring eggs for the Easter table. Maybe it is time to try some other methods? This time I will not talk about the symbolic of eggs, nor about its belonging to the celebration of the spring solstice or Christian church; I invite you to share ideas how to make this holiday more colourful and attractive. The most traditional method of colouring eggs that people have used for decades is the boiling in onion leaves. Furthermore, experts say that one must use exactly the leaves of the red onion and brown eggs so that the colour would be saturated red. Then follow different variations with different decorations, tying dried grass or flowers to it. I like to use grits very much, especially peeled barley and rice. Before putting into slightly cooked onion leaves, each egg has to be wrapped in a sock, in which you pour and even out some grits. Thus during the dyeing process small patterns, dots and dashes are created. Of course, there is a possibility to buy many different shades of synthetic egg dyes.As we approach Easter, the store shelves have a wide range of egg dyes. Particularly bright and attractive are the colours produced in Germany; they even have different types of pearly shine. Put on gloves, heat some water and put the colour tubes in, and then with a brush or simply with hands apply the colour. However, when the first effect of the commercial shine is gone, start to look for different opportunities of colouring eggs in more economical, natural and also healthier ways. So here you can use many bounties of nature - chamomile, to get the tone of a citron; mint and birch leaves add a light green shade; alder bark adds a brownish red shade.Take into account that when you dye eggs with natural colours, you should use white eggs. An original colouring together with scraping can be attained with the help of blueberry compote or jam.The eggs turn out blackish purple. 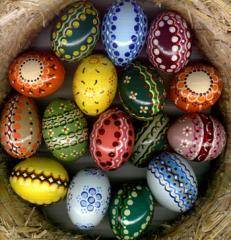 Wipe freshly painted eggs before they completely cool down and with a needle scrape an ornament or drawing. To make the egg shine after natural colouring, you can grease it a bit, soaking a cloth with some oil or butter. As every housewife knows, that, when colouring or boiling eggs in general, salt should be added not because of the taste but because the shell gets thicker. If you know any other egg dyeing techniques, feel free to share your experience and send pictures to my e-mail [email protected] with your artwork; I will add them to the article and let us together anticipate the coming of Easter!